Bronx 1987: straddled aboard their outlandish, fantastically outfitted, blazing chrome choppers, the Warriors prowl through the streets to slay members of rival gangs. Amid the acrid stench of charred flesh wafting up to the skyscrapers of Manhattan National Guardsmen cremate every hood in their path with lethal flamethrowers - the Bronx is on fire and the Warriors are burning for revenge! 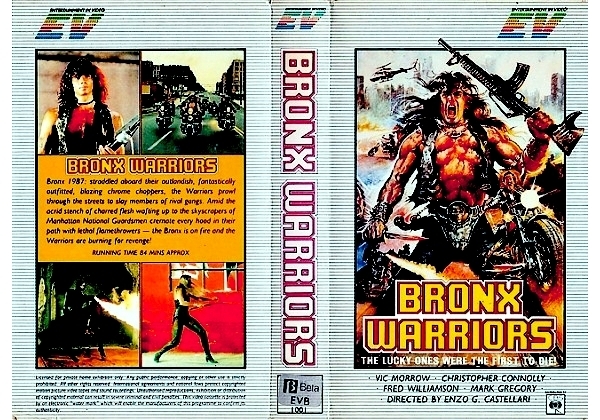 Or find "Bronx Warriors" on VHS and DVD / BluRay at Amazon.